I like strong female characters as much as the next mildly outraged feminist, but Celaena Sardothian is, on first impression, a bit of a cow. Not only does she make her living as an assassin, she's also an arrogant and vain young brat with a high opinion of herself that even a year of slavery in a salt mine hasn't tempered. She's offered her freedom in exchange for becoming the king's champion, but the catch is she can only take up this position if she wins a contest against twenty-three of the hardest men in the kingdom. Celaena has good reasons to hate the despotic king, so it's no wonder Captain Chaol Westfall has little time for her at first. The Captain of the Guard puts her under constant watch. Crown Prince Dorian is similarly wary of her, but his attitude thaws once they reach the palace and the contest begins. It's not quite a Battle Royale-style death match, but casualties are expected during the harsh training and weekly tests that will whittle the participants down to a single winner. Celaena starts with the conviction that she will win, although she conceals her true identity from the court and the other contestants at first. But her time in the mine has left her broken, and some of the men she faces are stronger and more skilled than she expected. Then one by one the contestants turn up murdered, and their bodies have horrific injuries. Something unnatural is stalking them, and although magic is outlawed the deaths have the mark of an ancient evil. Celaena has to find the culprit and stop whatever is getting loose before she or someone she likes becomes a victim, and she has to do it whilst staying on top and winning the contest. Because if she fails she'll go back to the mines, and she doesn't think she'll last another year in them. The setting is gorgeous: it's a vast glass castle, complete with hidden passages, ancient secrets and magic. There's ample opportunity for masked balls and other excuses to dress up as Celaena poses as one of the prince's fancy women. She has lots of romantic interest since she attracts suitors easily, even though as an assassin she's a terrible prospect for marriage. However she gets a lot more likeable as the story moves on. We see her softer side emerge in the friendships she forms with the underdogs, both in the contest and of the court. Her ice melts when we discover what really motivates her. Celaena isn't the only character who gets more engaging as the story progresses, and there are a lot of conflicts and mysteries that make this novel totally moreish. It's a quick and easy read, although I found it a touch predictable. It was easy to guess who the villains would be, and good and evil characters were too polarised. 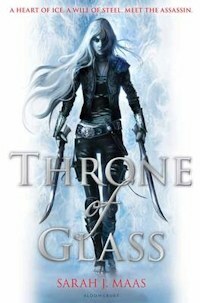 Throne of Glass is a fluffy romp with a heady mixture of hack and slash, romance, royal glamour, and ghosts in a fairytale kingdom. Its striking images and well-paced action make it enjoyable, even though some of the characters are a little transparent. Katsa has a natural gift for killing, but this talent means she is unable to get close to others and is at risk of exploitation. 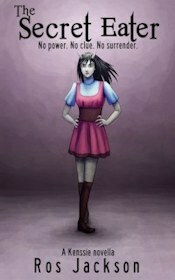 The first in the Graceling Realm series.